Long a home to members of the Lenni-Lenape Indians, the first white men came to the area now known as Lumberville in the early eighteenth century to find their fortune in copper. There wasn’t any, so they moved on. Hemmed in by wooded hills and water, the site was seemingly so remote that the land was not even surveyed and deeded until the middle of the eighteenth century, long after William Penn was dead. In 1775 Col. George Wall, Jr., Revolutionary War hero, civic leader, inventor, and entrepreneur, acquired 15 acres of land where the Paunacussing Creek meets the Delaware River. He established 2 saw mills, a grist mill, a general store and a school for surveyors. The village was known at that time as Wall’s Landing. The area was rich in hardwood forest, including stately white pines, as much as thirty-six inches in diameter, spruce, hemlock, oak, beech, American chestnut–trees that once were common here. Straight-trunked poplars and cherry were used for furniture. Wall’s Landing became important not only for its own wood products but also because lumber brokers from Philadelphia came here to bid on log rafts floating down from the Lehigh and Upper Delaware Rivers. The village was called Wall’s Landing until 1835, when a post office was established and the name was changed to Lumberville. The post office still exists as a post office/country store. 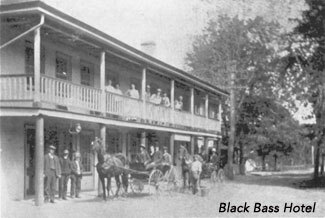 The first tavern was built about 1740 and although severely damaged by fire, it was rebuilt and today operates as the Black Bass Hotel. 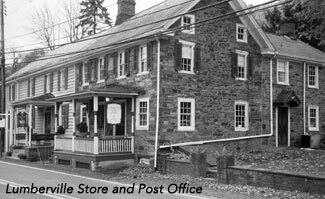 The Delaware Canal came through in the 1830’s displacing Wall’s mills, his house, and his store, but the businesses continued, changing hands often. 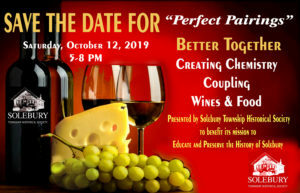 Eventually, in 1873, the property was acquired by William Tinsman who later abandoned the mill but continued the lumber business, which still thrives today under Tinsman family ownership. Excerpted from Lumberville: 300 Year Heritage by Willis Rivinus, 2006. 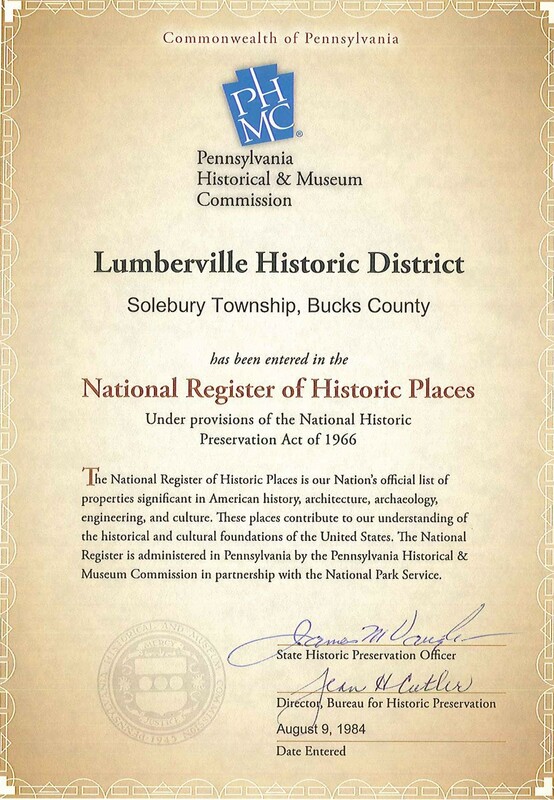 Read more about Lumberville on the Solebury Township site.